Yes, before anyone mentions it, I know that the layers could be called 'wrong', cheese should be over the patty so it melts - but I don't care! Haha. THEY ARE CUTE. 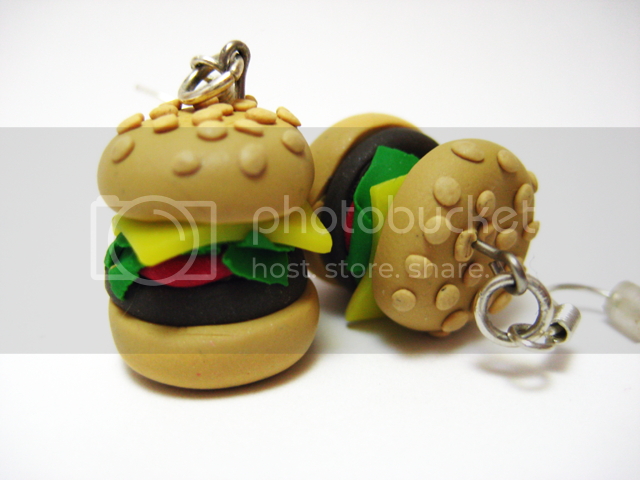 Made from Sculpey III Polymer clay and sterling silver jewellery bobbits*. I'm into reading, crochet, cross stitching & tv shows and movies that often get described as 'cult'. I've got most of the patterns of the cross stitches I make, and am very happy to provide when asked! I've got some in the Patterns Page already. Crochet patterns, I don't have because I make them up as I go along.. so all I can offer are suggestions to help recreate things. Budowa ploty PVC na plot i furtę ogrodzeniowa nie zada zezwolenia na to oraz zgłaszania tego faktu do urzędu nie licząc kilku przypadków. Bikyclist 2010-2012. Theme images by Bikyclist. Powered by Blogger.